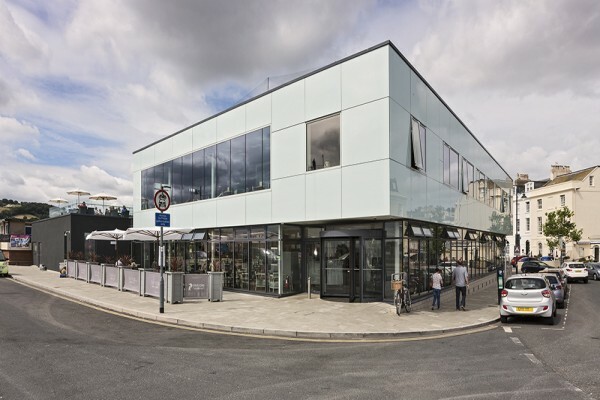 Creating a crisp and contemporary style for the new Pavilions Teignmouth building, StoVentec Glass cladding reflects the surrounding Victorian architecture and helps the new venue to provide a pleasing and contemporary visual contrast to its surroundings.. Some 600 sq mts of the StoVentec Glass system was used to clad the first floor of the new building. The rainscreen cladding system features a rugged, adjustable sub-construction with Sto-Stainless Steel Wall Brackets, aluminium support profiles and Sto-Rainscreen Duo Slab insulation. These are then covered with bespoke StoVentec Glass panels, which feature toughened glass that is bonded to lightweight carrier boards. All StoVentec Glass solutions are specifically designed to meet the requirements of each individual project, and this helped LHC Architects transform their ideas into reality. The new theatre underlines the tremendous versatility which the StoVentec Glass system offers in terms of design. Every StoVentec Glass project receives an absolutely bespoke solution and this gives designers great freedom, especially as the glass can be provided in a wide range of standard or custom colours, and can even be printed to carry individual logos and designs. The ground floor blockwork walls of the building were finished externally with StoRend Fibre Plus. This system uses a high quality fibrous levelling render which is embedded with a tough reinforcing glass fibre mesh that provides high anti-crack properties. This render has a dark grey colour which contrasts with the glass surfaces on the floor above, and will provide outstanding weather protection and long-lasting colour for the new theatre. The Pavilions in Teignmouth sit on the waterfront site of the previous Carlton Theatre. It has a flexible internal design and includes a 218-seat theatre which can be reconfigured as an events space for exhibitions and conferences. The building also incorporates various work hubs, a café, function bar, gallery space and a box office. StoVentec Glass can be used both as an external rainscreen cladding system and as an internal decorative option.